What is pool calcium hardness? 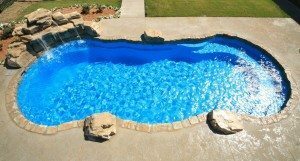 The swimming pool service contractors from Imperial Pool Builders in Decatur, Illinois work with swimming pool owners to address the potential for calcium hardness and overall swimming pool water quality. Calcium chloride, or CaC12 is naturally occurring chemical that happens in swimming pools. It is also what is measured when people say they have “hard” or “soft” water in their homes. High levels of calcium chloride lead to hard water, low levels lead to soft water. When the water in your swimming pool is tested by your pool contractor he will make note of whether it’s soft (under 150 parts per million) or hard (more than 400 pom). Soft water will create its own hardness and pull calcium from the pool’s plaster or tile grout. If you have a vinyl liner pool. here is no place for the water to pull calcium so instead it will corrode the pool liner leading it to lose plasticity and eventually lead to structural failure. Fiberglass pools will become “etched” and lose gloss if the calcium hardness levels are too low. Your pool contractor will add calcium chloride to raise the levels. Hard water can lead to scaling. Crystal-like formations will form on the pools’ surface, tiles, inside plumbing or on equipment. Hard water, high calcium levels, lead to hazy or cloudy pool water. When the pool water is too hard your pool contractor will dilute the water by adding softer water or add a chemical solution. As part of the pool maintenance and service package your pool contractor works to keep calcium hardness levels between 200 and 400 ppm as a way to avoid any issues with it and with total alkalinity in the pool water. How will he calcium hardness? The water chemistry will be tested. After the water chemistry and calcium hardness has been addressed, he will remove the stain and scales. The water’s alkalinity may need to be adjusted to prevent issues in the future. He will use a surface cleaner to remove scale and build up. Calcium build up and scaling are not usually noticed by the homeowner until it is an obvious on the pool walls. By the time this happens it’s necessary to call in a pool service professional to get the water chemistry straightened out, if you don’t typically work with a contractor.